Intelligent Agent systems, such as mobile sensors, cameras, etc., have become an important branch of distributed processing for the Internet of Things. Because of its strong interactivity, robustness and scalability, it has been widely used in military, industrial, medical, transportation and other fields. The intelligent Agent system for the Internet of Things is a collection of intelligent terminals with signal processing and mobile capabilities. Among them, each intelligent terminal carries out signal transmission and distributed processing with other intelligent terminals. However, most existing communication architectures, including their signal processing protocols and control algorithms, are designed for centralized networks by default. It is impossible to directly upgrade the incumbent networks, in order to accommodate the incoming large-scale and fully distributed Internet of Things, without a complete re-design or re-invention of the topology control, or distributed signal processing methods. Meanwhile, theoretical researches on large-scale and distributed networks in existing literatures can barely satisfy the demand. The aim of this special issue is to capture recent research and seek contributions of high-quality papers in this field. Under the support of related worldwide researchers, 47 papers have been received. Based on the review comments from peer reviewers, 21 papers have been selected out for the special issue and authors have revised their paper according to the comments before the final acceptance. The 21 paper which cover broad topics are introduced briefly as follows. The paper “Text sentiment analysis based on CBOW model and deep learning in big data environment” presented a text sentiment analysis method combining Bag of Words (CBOW) language model and deep learning. This method can accurately determine the emotional category of the text and is robust. The paper “Distributed-observer-based fault diagnosis and fault-tolerant control for time-varying discrete interconnected systems” proposed a fault-tolerant control approach for a class of discrete interconnected systems. The results verify the accuracy of the theory and method. The paper “Research on optimization of multi stage yard crane scheduling based on genetic algorithm” Considering the order of container extraction by gantry crane and the times of container extraction. The algorithm proposed in this paper is compared with the toolbox algorithm through an example calculation. In the paper “An improved apriori algorithm based on support weight matrix for data mining in transaction database”, an improved Apriori algorithm is proposed in this paper, which is to build the 0–1 transaction matrix by scanning transaction database for getting the weighted support and confidence. This improved algorithm shortens the running time and reduces the memory requirement and the number of I/O operations. In the paper “An edge computing offloading mechanism for mobile peer sensing and network load weak balancing in 5G network”, a real-time and efficient edge computing offload mechanism was proposed. Simulation experiments and mathematical analysis results demonstrate the advantages of the proposed algorithm in terms of real-time performance, resource management level and computational efficiency. In this paper, “Frame rate up-conversion algorithm based on adaptive-agent motion compensation combined with semantic feature analysis”, a novel video frame rate up-conversion (FRUC) technique based on adaptive motion compensation is presented by combining the semantic feature analysis for image sequences. Experimental results show that the performance of our method is better than those of the popular I-FRUC, B-FRUC, F-FRUC and A-FRUC methods in both objective and subjective quality, which has relative advantage for engineering applications. The paper “Information fusion for wireless sensor network based on mass deep auto-encoder learning and adaptive weighted D–S evidence synthesis”, proposed an information fusion algorithm for wireless sensor network based on mass deep auto-encoder learning and adaptive weighted D–S evidence synthesis. The paper “Online model-learning algorithm from samples and trajectories”, proposed an online algorithm where the samples for learning the model are both from the samples and from the trajectories, called Online-ML–ST. Other than the existing work, the trajectories collected in the interaction with the environment are not only used to learn the model offline, but also to learn the model, the value function and the policy online. The experiments are implemented in two typical continuous benchmarks such as the Pole Balancing and Inverted Pendulum, and the result shows that Online-ML–ST outperforms the other three typical methods in learning rate and convergence rate. In the paper “Research on a new automatic generation algorithm of concept map based on text analysis and association rules mining”, A hybrid TA–ARM algorithm for automatic generation of concept map based on text analysis and association rule mining is proposed. The contrast experiment shows that the quality of the concept map automatically generated by the TA–ARM has a high quality and can visualize the associations between concepts and provide optimization and guidance for knowledge visualization. This paper “An alternative approach to determine cycle length of roadway excavation in coal mines”, presents a new approach to determine the LCE for the excavation of roadways in coal mines. The paper “Articulatory and acoustic analyses of Mandarin sentences with different emotions for speaking training of dysphonic disorders” can be the basement for constructing the functional relation between articulatory parameters and acoustic parameters of emotional speech in the future in order to help individuals with dysphonic disorders to do speaking training. In the paper “Security authentication technology based on dynamic Bayesian network in Internet of Things”, a security authentication technology based on dynamic Bayesian network combined with trusted protocol is proposed. This algorithm has an adaptive capability and can quickly react to the denial of the service attack, which effectively suppress the threat of abnormal entity in the IoT. In the paper “Web cache intelligent replacement strategy combined with GDSF and SVM network re-accessed probability prediction”, proposed a web cache replacement strategy combining greedy dual size frequency (GDSF) algorithm and support vector machine (SVM) re-accessed probability prediction. The proposed strategy has a higher request hit rate and byte hit ratio. In the paper “The optimal game model of energy consumption for nodes cooperation in WSN”, the authors propose an optimal model of energy consumption for nodes cooperation based on game theory. This paper also verifies that the optimal game model of energy consumption for nodes cooperation has better stability. In the paper “Social recommendation algorithm based on stochastic gradient matrix decomposition in social network”, aiming at providing a general method for improving recommendation systems by incorporating social network information, we propose a social recommendation algorithm based on stochastic gradient matrix decomposition in social network so as to improve the prediction accuracy. The empirical analysis on two large datasets demonstrates our proposed algorithm has lower prediction error, and is obviously better than other state-of-the-art methods. In the paper “Multi crowd fast power control algorithm based on neighborhood opportunistic learning”, neighborhood opportunity learning multi intelligent power quickly swarm intelligent control algorithm is presented. The experimental results show that the proposed algorithm has a significant advantage in real-time, reliability and cost of intelligent management and fast control of power generation to adapt to a variety of power generation devices. The paper “Internet of things control mechanism based on controlled object information perception and multimode image signal processing”, proposed a stable and robust IOT control system based on the controlled object information sensing algorithm and multi-mode image signal processing. In the paper “Bi-dimensional empirical mode decomposition (BEMD) and the stopping criterion based on the number and change of extreme points”, bi-dimensional empirical mode decomposition and the stopping criterion based on the number and change of extreme points is proposed. In the paper “To strengthen the relationship and the long term trading orientation between the relationship quality and the B-SERVQUAL: focus on the logistics intelligent equipment manufacturing industry”, this study provides methodology approach according to the long-term and macroscopic dynamic concept applied with multiple techniques, unlike the existing correlation and the regression analysis in applying the methodologies between the service quality and the lower dimension. In the paper “Improved convolutional neural network combined with rough set theory for data aggregation algorithm”, the authors proposed a novel information aggregation algorithm for wireless sensor network. The energy consumption of the granular CNN model can decrease obviously and the accuracy of the data aggregation can be effectively improved. In the paper “Intelligent task allocation method based on improved QPSO in multi-agent system”, an intelligent task allocation method based on improved quantum particle swarm optimization (QPSO) algorithm is proposed. Simulation results show that this method can shorten the task completion time and balance the system load. 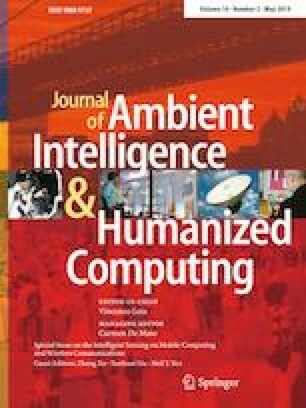 This special issue has been made possible by the strong support of Prof. Vincenzo Loia, the Editor-in-Chief of the Journal of Ambient Intelligence and Humanized Computing. We would like to express our gratitude to the authors for their contributions, the referees for ensuring the quality of the accepted papers, and the staff of the Editorial Office and Production Department for their help in finalizing this special issue.